Remember, your new rental house is at 2407 North 66th Street. Make a note of it! There’s no reason to bother your new neighbors three or four doors south, at 66th Street between Sheridan and Vernon. The canal path runs right by there if you’re super-curious. If the tunnel mouth dug out of the west bank of the canal were still there, you’d be able to duck down inside, with a flashlight, in the shade and the relative cool, to crouch through the scraped-out 178 feet back west to a point under a box of coal in the bathhouse of a POW camp. As you might expect, most of the tunnel traffic came the other way. Del Webb built the POW camp in Papago Park in a big hurry, along with the Florence POW camp and the Japanese relocation center in Parker. The escape of 25 German soldiers from Papago was well-covered by Robrt Pela in the New Times not too long ago (hi Robrt) so no need to retell the whole thing here. The usual punch line is that the Germans smuggled out an inflatable raft thinking they could float down the Rio Salado to Mexico and freedom, so ha ha on you guys. Most of the camp was not in the park’s boundaries. The camp’s borders were roughly Thomas on the north, McDowell to the south, and from 62nd to the canal. The center was 64th Street (then Holiday Avenue) and Oak (then Moss Street). Only the southwest quarter of the camp overlapped the very northeastern portion of the park. Didn’t matter much — all of it was equally empty, flat land. The camp went up in June 1943, with eight-foot barbed-wire fences and perimeter guard towers just as you’d imagine. Four of the camp’s five prisoner compounds stood where Hy-View is now. Almost nothing remains of all this. Although the oversight of the prisoners may have been a little lax the basic logic of putting the camp here was flawless. At the street corner of McDowell and 66th Street in 1944, anybody hopping over outside the fence line had a long walk to nowhere, no food, nobody in sight, plenty of scorpions, scrub brush, oceanic stillness. As Robrt’s story brings out, it was only the most duty-bound Germans who even tried to leave. Why would they? Inside they had three square meals, tennis, horseback riding, swimming, sunshine, optional part-time jobs picking cotton, and nobody shooting at them. As angry locals pointed out they even had bacon. Twenty-four of the duty-bound Christmas bunch were caught easily. The ringleader alone walked north, lived in a mountain cave for a few weeks, and occasionally smuggled himself back into the camp for food. His best bet was back inside. He was eventually caught downtown when he asked directions in his heavy accent, and that was the “Great Escape”. You get the feeling that the postwar years for Papago Park were sort of ominous. In 1950 the Fish & Game Department up and abandoned the fish hatchery. Between 1946 and 1954 a dirt racing oval northwest of Thomas and 64th cycled quickly through several identities (the Phoenix Speedway, the Thomas Road Track, the Ingleside Track, Arizona Downs) but couldn’t make either horses or cars pay off. 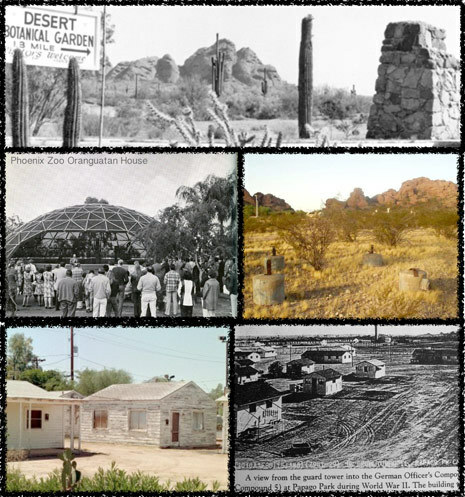 The advent of the Arizona state park system ironically ended up with Papago Park pushed under Phoenix city control. One source has the park fenced off from the public for awhile. McDowell was extended in 1953 straight between Barnes Butte and Big Butte. Meanwhile, anticipating growth this direction, the cities of Phoenix and Scottsdale fought like two kids in a back seat over their imaginary boundaries in 1956, pulling stunts like surprise late-night annexation meetings. Phoenix, with its slightly longer arms, won most of those fights. In 1957 Frank Lloyd Wright called a press conference at the Westward Ho to present his Oasis plan to the newspapers, a plan that would have moved the Arizona State Capitol from downtown to the unused park, where state government could have spread out in futuristic festival-marketplace splendor under a turquoise-colored polygonal concrete lattice. Take that as seriously as you like, but it’s an amazing design, a proposal with plenty of nerve, and the origin of the blue spire in North Scottsdale put up in 2004. Happily, and largely from community-minded action, things in Papago Park started turning around by 1960. The zoo went in and gave a new rationale for Governor West’s dubious lagoons. Galvin Parkway opened and the Botanical Garden opened. The first nine holes of Rolling Hills went in in 1960, and all eighteen of Papago Golf Course opened in 1963. The park as a whole got cleaned up, accessible, developed, and began to see a lot more heavy use, but also finally came into its own as a great civic asset. As it is today. There’s more to know about Papago Park. If you’re interested in the Oasis project they may still have the model on display upstairs at the old capitol. There’s more mysterious civic furniture to explore, like the Eisendrath House, Governor Hunt’s tomb, and that abandoned CCC sunrise-amphitheater carved into the rocks. Personally I’m curious about the tuberculosis hospital although I don’t expect anyone to share that interest. And some day maybe we could arrange a tour of that Cross Cut Hydro Plant, I don’t know. It looks like the Hy-View subdivision was an early arrival in these parts, platted in 1959, many of the houses finished up in 1960. Hy-View’s neighbor east across the canal was the Round-Up Drive-In. Depending on their ages and frames of mind the residents of those brand-new houses were either delighted or distracted by the 30-foot happy neon cowboy out front over there, and any stray glimpses of huge luminous black and white faces, and the sound of a hundred car engines starting up together when the show stopped. Either way the drive-in theater was proof that in 1960 this was a ragged undeveloped edge between two desert towns that still seemed a long way apart. Let’s draw the curtain right there.